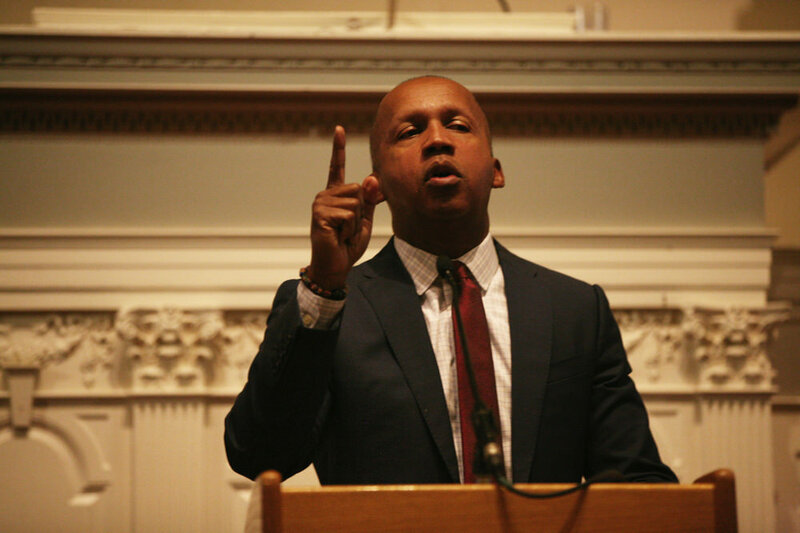 The audience could sense where the story was going almost as soon as Bryan Stevenson began telling it. Two black children in the barely desegregated South, hurtling with giddy, unguarded elation toward their first swim in a pool that until recently had been available only to whites. A swim they’d been dreaming of for years. As Stevenson, J.D.-M.P.A.’85, LL.D. ’15, kept talking, an electricity of unease began to intensify among the listeners packed into First Parish Church last week—as many people as the pews would hold—who’d come to hear him deliver Harvard’s 2017 Tanner Lecture on Human Values, hosted by the Mahindra Humanities Center. Stevenson, whose speeches thread the heaving cadences of a sermon with the stark assertions of a summation, came to Cambridge last Wednesday to talk about memory and forgetting and legacy and liberation and a brokenness several centuries deep. He’d come to talk, he said, about narrative—how we think about it, live our lives through it, find ourselves and our world shaped by it—and about the cultural narrative that he insisted again and again must be changed. That narrative, he argued, presumes African Americans are inherently dangerous and guilty, more deserving of punishment, less capable of achievement; it is a “narrative of fear and anger,” Stevenson said, that upholds white supremacy. “Fear and anger,” he added, “are the essential ingredients of injustice.” Fear and anger allow societies to tolerate intolerable abuse. But first: “I want to talk about how I got here.” That swimming pool. The giddy elation. Growing up in rural—and, for a time, still segregated—southern Delaware, Stevenson and his younger sister had always watched white children playing in the public pool (which closed as soon as integration came) and the hotel pools along the boardwalk (which his family couldn’t afford). “It looked like it was the most joyous, glorious thing a child could ever experience.” Then when he was 11 or 12, Stevenson’s mother announced a family road trip to Disney World, with a stopover in South Carolina at a hotel with a pool. He and his sister were so excited they wore their swimsuits under their clothes on the bus. As soon as it pulled into the hotel parking lot, they ran toward the pool and, holding hands, jumped in. The water, he remembers, was perfect. Homi Bhabha, director of the Mahindra Humanities Center, introduces Bryan Stevenson. He talked about the years he spent at Harvard, feeling disillusioned and out of step as a law student interested in poverty, racism, and social justice. He recalled the job he took at a Roxbury social-service center—“the most radical and important thing I did as a law student”—and how it allowed him to “get proximate” to the suffering and inequality he wanted to understand and alleviate. He exhorted listeners to get proximate too: “It is key to our capacity to make a difference.” He exhorted them to stay hopeful—without hope, “you’ll get vulnerable”—and to be willing to do uncomfortable things for the sake of social justice. Stevenson’s talk reminded Tommie Shelby, Titcomb professor in African American studies and philosophy, of Martin Luther King and the “inseparable twins” of racial and economic injustice. In a panel discussion that followed the lecture, Shelby recalled that after the Watts riots in Los Angeles in 1965, King turned his attention to abolishing “ghettos” in the North. “Mass incarceration is also an economic injustice issue,” Shelby said. Stevenson thanked her for her work and acknowledged that “community creates a kind of strength and capacity that’s hard to sustain without it.” And then he told one last story. When he was a little boy, his grandmother took him home to Bowling Green, Virginia, where she was from, and dressed him in a suit and walked him out to an empty shack in the middle of a field. When they stepped inside, she told him, he would hear something. But he didn’t. He heard nothing. “And I looked at my grandmother, and she started to cry.” He’d never seen her cry before. And so he cried too. “I said, ‘Mama, I didn’t hear anything.’ And she said, ‘Yes you did.’” But he still heard nothing. Stevenson looked up at the woman, still standing at the microphone. “So I don’t actually think the work we’re trying to do is work we’re doing alone,” he said. In the First Parish sanctuary, packed to the doors with hundreds of people, no one made a sound.